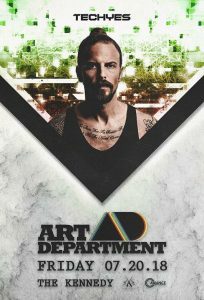 Art Department, the infamous electronic music act, has seen almost unparalleled success within the world of dance music in recent years. Canadian Jonny White, acting Head of No.19 Music, is now the lone force behind the influential project that began as a collaborative effort with long time friend Kenny Glasgow in 2009. The prolific producer’s original style landed AD at the forefront of a major underground music movement, transcending genre barriers and breaking down walls as few other underground artists have.